Campaigns are the combinations of news releases, distributions, clippings and reports in pr.co. 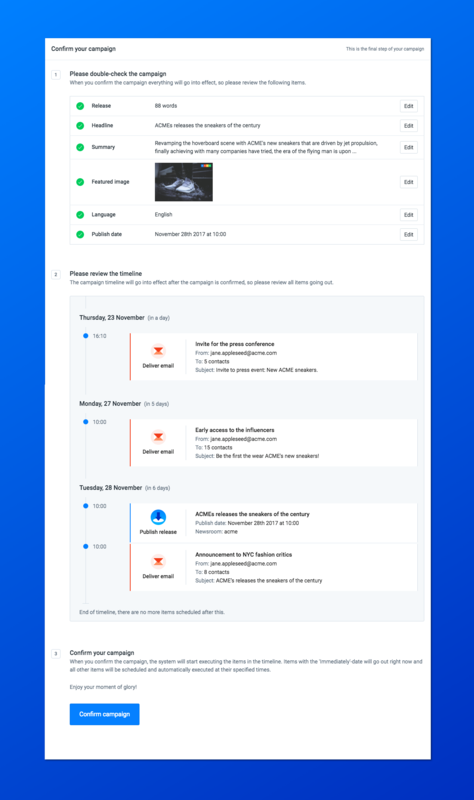 They are the very core of our product and will make you write your message, optimise it for web, set the release date, set distributions, add clippings and view the results. We will guide you through the steps one by one. Please note that you'll find a dedicated user manual for each step in the Help dropdown in the blue topbar in the Edit steps of your campaign. This is where you write the actual message that get published on your newsroom and will be distributed to your contacts. The settings step (previously called 'Optimise for Web') is an entirely new step for pr.co, with this step we ask you to think carefully on what your message will look like all across the web. The timeline is an overview of the things that will happen in your campaign, and when they'll happen: when the release will be published, and when distributions will go out. When you go to the timeline the first thing you do is set your Publish Date. 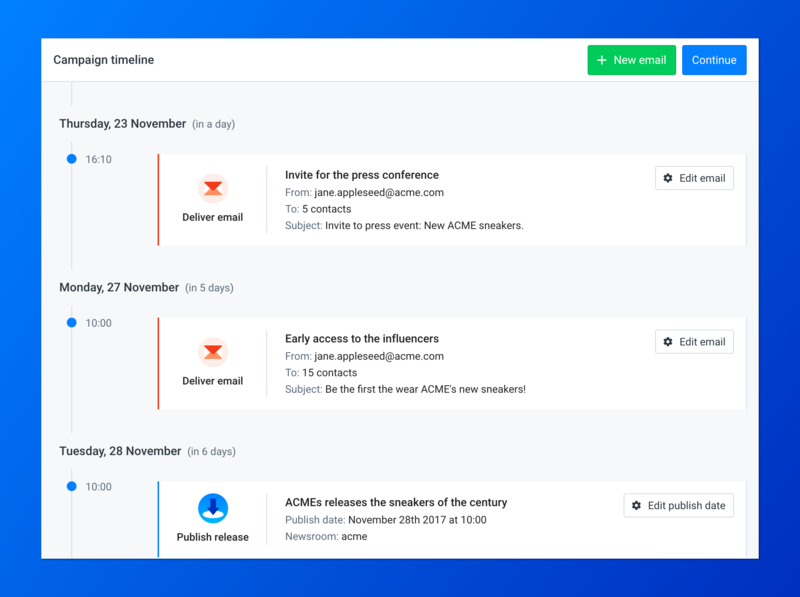 The moment your message is published it will appear on your newsroom, be publicly available on the web, emailed to your newsroom followers and search engines will be notified of the new content. 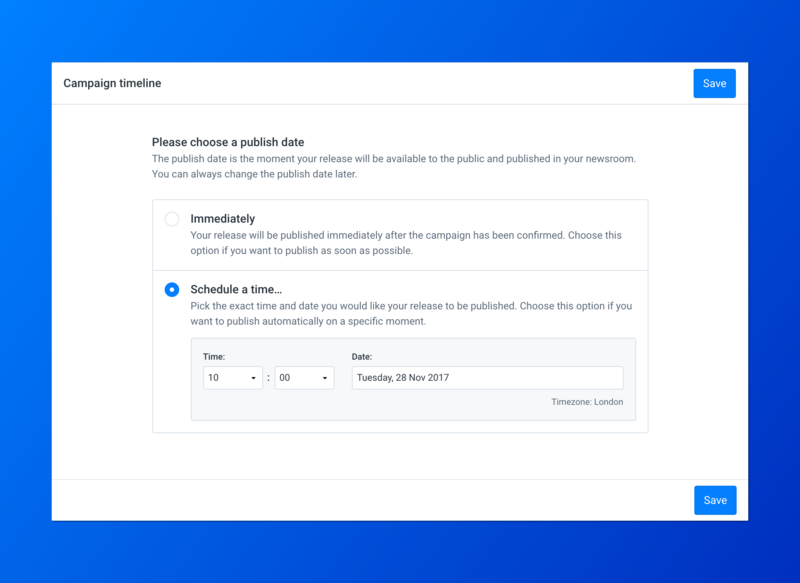 Once you've set your Publish Date you can add distributions to your timeline. 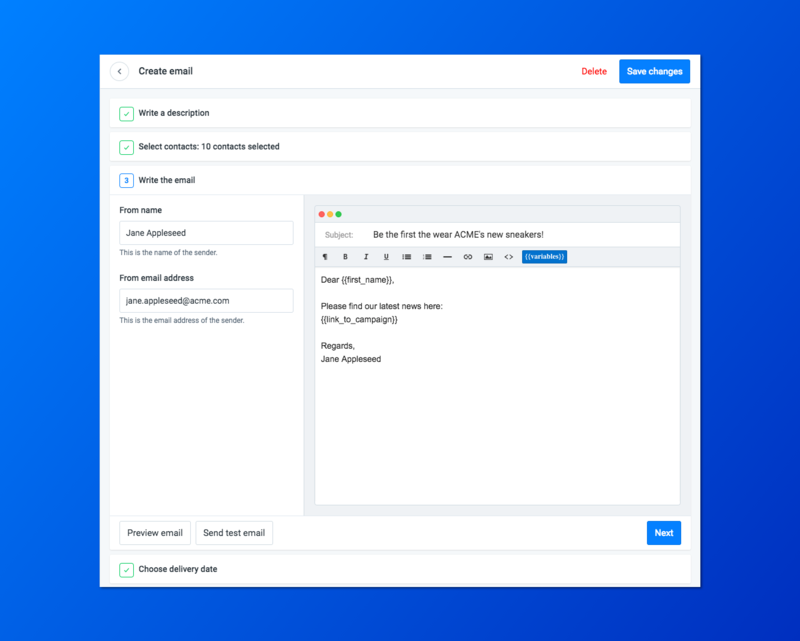 Distributions are emails you sent to a list of contacts in order to have them read your message. These contacts can vary from journalists and influencers to stakeholders, friends and customers of your company. That's all for now, we'll update this article as the Campaigns evolve. Make sure to let us know if you run into any issues or if you have feedback hello@pr.co!